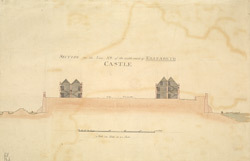 Section of the middle ward of Elizabeth Castle, Jersey. Elizabeth Castle was built on St Helier’s Islet in St Aubin’s Bay, on the site of a former priory, to replace the outdated Mont Orgueil fortifications. Work began in 1551 but progress was slow until the appointment of Paul Ivy as Engineer in 1594 who developed the Upper Keep. Sir Walter Raleigh was was Governor of the Island between 1600 and 1603 named the castle after Queen Elizabeth I. In the mid 17th century the castle was extensively remodelled with the addition of store rooms, a powder magazine and various barracks rooms. The castle continued to grow and by the 18th century was heavily fortified.